TODAY is what has been dubbed the #Karankaversary. It a year since Boro appointed Aitor Karanka as their new boss. I think it is fair to say it has been a year of marked change on and off the pitch. A year of of steady if not spectacular improvement in every department of the team and of results and performances. And a year of reshaping of the attitudes that surrounds the club. Karanka is all about professionally planned progress. For me, that was evident from the day he arrived. Before that in fact. The club had been rearranging the furniture and finances behind the scenes for the best part of two years, rebuilding the infrastructure with sports science, scouting networks, the Academy and external links that plugged them into a network of intelligence and best practice to create a sustainable model for a club of limited income but big ambitions. They had restructured the finances, trimmed the wage bill, balanced the books and created the headroom for a renewed, well resourced promotion push based on VFM recruitment. We have talked Mowbray to death but his era was over and Steve Gibson had a massive decision to make. He could not afford to squander the moment. It was probably his most important appointment since Bryan Robson and one that would determine the club’s fortune for years to come. He had to get it right with a manger that bought into the project, was able to work on a budget but – crucially – was able to quickly deliver a meaner, leaner team that delivered success. That is the tricky bit, getting the right fit. Has he done that? The early signs are good. A year on Boro are well placed, are looking like a team that can only get better and, judging by the results of the Gazette’s Karanaka first annual report, supporters are upbeat and confident in the manager. Here’s a few things I wrote at the time as background. In a couple of lengthy discussions with the chairman I was given an insight into what the club’s intentions were, what the strategy and philosophy was and why they had to get it right. And on the day itself – which started with a breakfast meeting in the inner sanctum at Rockliffe for myself and Mr T – here’s my “Basque To The Future” bit I wrote on why Karanka ticked all the boxes for the club and was key to their ambitions and here’s the exclusive Q&A with the chairman over the cornflakes. There will be loads of stuff in the Gazette over the new few days, especially interesting is the in-depth sit-down Philip Tallentire did with him over the summer, a really good insight into his youth, his Basque heritage, this thinking and his willingness to learn. Look out for those. The first bit is here. And to add to the debate, here’s an honest and perceptive blog bit by our resident vocal Karanka-sceptic Paulista Park – a passionate advocate for the ‘Spirit of Teesside ethos under Mogga – on how the Spaniard has transformed Boro in his first year. So, how has it been for you? 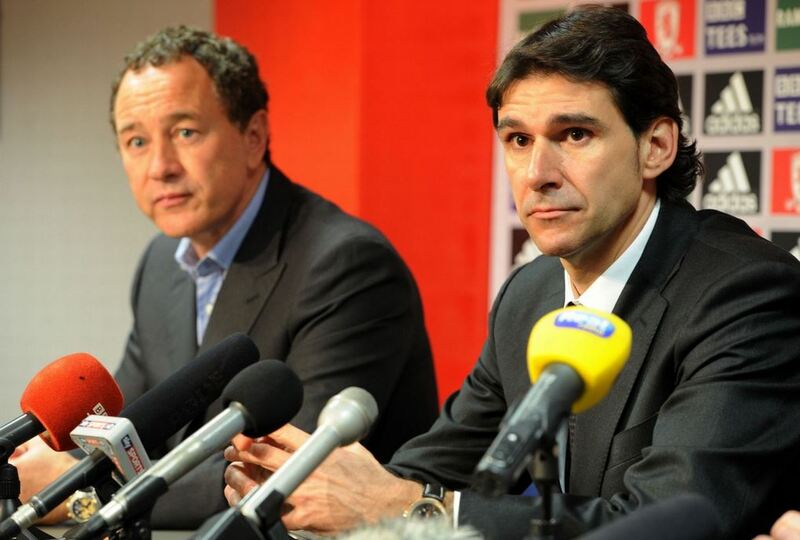 How much has Karanka changed the club? Has he the ability and determination to deliver promotion? Has he been a success? Or is it too early to tell? And has the transformation come at a cost of the club’s Teesside accent? What say you? The Gazette Boro posse have also done a trial podcast, a kind of pre-season friendly run-out to blood new technology and platforms. We just riffed a bit on the theme of Aitor’s first year in charge and his ruthless and painfully professional approach in which I suggest he is so tough he would drop his grannie from Christmas for failing to close down the cranberry sauce last year. You can listen to it here. If it gets an audience of more than a reserve game we may make it a regular thing. It is as yet nameless and we are inviting suggestions. The winner gets eternal glory and the chance to brag to mates. You can tweet your ideas to @GazetteBoro. How weird, the post that went missing was about Wolves, did it appear then dissolve in to the ether? It is difficult and I know what you mean. At Wolves some fans turned turned up trying to buy a ticket on the night with no joy, seems utterly pointless to me to turn away people who are going to pay you nearly thirty quid to sit amongst the away fans with no risk of trouble. Even better, the other teams fans are paying you money. There was another lad who turned up and spoke to the stewards, he had come to the match with friends who had got him a ticket to sit amongst Wolves fans with them. He asked if he could come and sit with the Boro fans. The answer was no. All absolute nonsense. You just despair at the lack of common sense. The reason you old codgers cant but a ticket in the away end is because too many other fans are complete doyles. You could be sitting good as gold in the away seats but that doesn’t mean a couple of drunken cretins in the home fans won’t have a go at you if they see you body language celebrate a goal. So many people these days can’t take their ale and can’t control their tempers. I’ve seen it here where idiots have tried to lean over three rows to tale a swing at Man U/Leeds/Newcastle fans. Grown men too. It is the same when people complain why they can’t have a quiet civilised can of beer on the train home from London games. Its because doyles in the next carriage are too busy being sick over tables because they started drinking before breakfast and are shouting and swearing in front of families and other passengers. The idiots ruin it for the rest of us. I enjoyed the podcast. It gave a bit of behind the scenes colour and insight into how Karanka runs the club, the level of detailed professionalism he has brought in and how everyone in the club from top to bottom is responding to his demands to raise the bar. I like the idea that he gave Leo a rocket for giving an “unauthorised” interview. It is good for you that he is reading the paper I suppose. It shows how closely he looks at every detail about the club. You can see that on the pitch. I like that the players are scared on him too, I think at times in the past (eg under Southgate and Mogga) the players have had it too easy and they haven’t given everything for the team and the club. Even Strachan who was a harder taskmaster and wanted ‘men’ had to complain about their Ferraris and life inside the bubble. I’m starting to get the impression that Karanka demands more and gets more from the team and that he doesn’t want to be the players’ friend or even be liked. He just wants success. Quickly. I like that. Hope you lads do more podcasts. You know more than most and can gibe us a bit of behind the scenes gossip. How about “Riverside Raw”? Went to the ticket office at Wigan Athletic this morning. Unfortunately I drew a blank. The problem, is that the away team’s allocation has sold out. This means that in order to stop Boro fans purchasing tickets in the home enclosures you have to be registered on their data base as having previously purchased match tickets. Although my drivers licence shows a Wigan post code this was not deemed acceptable. You can register with the club, but then you have to wait until the next game before tickets may be purchased. I haven’t given up yet, I will ask around all my local contacts here and see what I can come up with. In the mean time AV, is it not possible for MFC to request from Wigan some more seats? Surely it is advantageous financially, for them to sell as many as possible? **AV writes: It depends on the internal configuration of a ground. If you have a whole block that is confided with dedicated facilities it is relatively easy (ie cheap) to steward. If you spill into another block with shared concourses etc then the police get involved to guarantee segregation and clubs have to pay for every bobby used on their property (Saturday, double time) so unless they are selling whole stands at a time it tends to cost more than they make in the extra ticket sales. There also reaches a point where a large away crowd impinges on “home advantage” and Wigan may have already passed that. Thanks to all of you who posted on my blog – I’m just about up to date with replies. Hard graft this blog lark. **AV writes: The first two or three years are the worst. …the next two or three years are the worst, too. The third two or three years: you won’t enjoy at all. After that, you’ll go into a bit of a decline…..
Ah, the joys of good old Douglas Adams. Interesting debate Robbo v Karanka in the Gazette. Of course Robbo and Karanka have been Boro managers under very different circumstances and it’s far to early to judge Karanka. But the very fact that some of us are saying he may be one of Boro’s best ever says it all really. If he gets us promoted, established mid-premiership and stays five years or so then at that point I’ll say he was one of the best, if he maanges to land a trophy (it’s important to dream!) then he’ll be better than Big Jack in my eyes. It is very difficult to compare managers from different eras, it is difficult enough from one to the next. I know who is towards the bottom of the list, step forward Raich Carter. At the moment Aitor is doing just fine, in my eyes he has given us what we have lacked which is direction. I like his straight talking approach and I think fans are buying in to what he is doing. Anyway, my Derby colleague is chuntering at paying over £30 for tickets at the Riverside. He thinks it is expensive. Ian, tell your Derby colleague not to bother, long way to travel to see your team loose…. Point taken AV. Let’s consider another scenario. You are a Wigan fan, yet you didn’t agree with Uwe Rosler’s appointment and vowed not to go as long as he was the manager (perish the thought). You decide to now go and support the new manager, but unfortunately you haven’t been all season, therefore you can’t get a ticket for the new managers regime. I for one don’t particularly like being behind the goal and prefer a main stand seat and whether it’s 5,000 or 6,000, considering the vocal support away fans tend to generate then I imagine “Home advantage” has already been surrendered. Not much different to an FA Cup tie. Plus an astute business man like Dave Whelan must have one eye on the attendance. It’s a pity we can’t have some sort of honour system whereby honest law abiding and respectful fans can sit where ever they like in a ground if seating is available. I have sat in many a ground amongst home fans and never had a problem, although to be honest I have kept a low profile and only resorted to mild appreciative clapping when a Boro goal goes in. I have now taken the task of getting tickets to Holy Grail status, for myself and Sir Len of Masterman. I bet a ticket agent could get you a ticket, no bother. For fear of sounding a smarty pants, I think that’s why they’re called ticket agents. There’s always the chance that you might not be sat amongst like minded people, the “honour system” would have to be a mutual thing between both clubs. If you have a look at the stadium (attached), it looks like we have an end all to ourselves. The Riverside and Pride Park (Ipro) are almost like a ship with bulkheads where you can split blocks off one by one. It was relatively easy to move the away fans because you close the doors either side. If we allocated three blocks instead of two it probably wont make much difference to stewarding/policing. At the DW I guess it would spill in to another stand. That would make the incremental cost not worthwhile as you would have to duplicate the stewarding in another stand, separating home from away fans. It may mean asking both season ticket holders to move (only joking Latics fans). I wait to AV’s comment on this with interest. I quite agree that he spent a lot of money but not much results. I loved Juninho but imagine Karanka with a Ravanelli on his side … Up the Boro! **AV writes: It is about where you start. Robbo took a unfashionable second tier club and firmly established them in the top flight via THREE Wembley finals (real ones) and provided a dream time when any player in the world was suddenly a realistic target. For a brief period he made Boro a story, a national player and more important, he made the vision of the Riverside Revolution a reality. That is a result no matter how you look at it. I was quite surprised that I managed to order two tickets for the Wigan game – I haven’t been to many games over the past two seasons and not to one at all this season. I feel a bit guilty that I’ve got two and you’re missing out GHW – to the extent that if you can’t get two I’ll be happy to sell you mine for their face value. You’d have to collect them from my office in Wigan but the offer’s there if you struggle. **AV writes: That’s a very generous offer Martin. Top man. That’s very good of you Martin. I find myself in the area on an unexpected visit so it wouldn’t be the end of the world if I didn’t make it. However, if you fancy an afternoon with Blog Royalty then I’m sure you would have a great time with Len. I still have local people here I know asking around, so I think something may turn up. Once again I’m reminded of how brilliant people from the Boro are! No better not. My missus won’t like it and pleas of teamwork are unlikely to be well received. We’ve already come close to an uxorial amputation on the blog. So while we wait for ‘proper’ football to start again…..the big topic for me isn’t AK vs Robson (AK every time for me……Robbo got lucky with a generous chairman allowing him to spend big, think what AK could do with the equivalent today!) it’s the FIFA debacle. My question, and I am genuinely interested in people’s feelings, is: would you support an England boycott, either as part of a UEFA response or as a solo FA protest (hoping that others would join)? Personally I have no intention of ever supporting the quite startlingly corrupt organisation again until reform is underway, and would be happy to forgo the travesty of 2016…….in the expectation that a rival organisation/tournament could be brought into play. But what does anyone else think? **AV writes: You can’t transplant managers into different financial landscapes. To buy the Brazilian player of the year and the bloke who scored in last year’s Champions League would cost £100m plus. The revolution will have to start somewhere and I for one would support an England boycott. At the moment I think a lot of associations are looking down the line to see who blinks first. If the FA were first no doubt the cynics would say we wouldn’t have won anyway but that’s not the point. Somewhere someone has to have the nerve and start the revolution against Blatter’s utterly corrupt regime. Bloody hell, if Atlantis made a bid with enough brown envelopes and watches, divers watches of course and I believe Omega make some good ones as do Rolex, he’d play it underwater. Yes that just shows the lunacy that has run all through the game! I think the point you made in the EG article was fair, Robbo wasn’t really a manager, not like Big Jack or AK (I think a much better comparison would be AK to BJ)……Robbo was the icon of SG’s valiant attempt to put Boro on the footballing main stage…….and he nearly succeeded. But HAD we had what I like to call a ‘proper’ manager AND who had the talent that Robbo had at his disposal, well who knows where we may be now? It’s a moot point, would the big players have come had Robbo not been here? He was the big draw, we all knew that. What if El Tel had come in earlier and we’d actually pulled off the two of them working together, footballing nous accompanying talismanic magnetism??? No it would never have worked, would it!!! Whoops….accidentally posted that under my alter-ego!!!!! It’s me, Smogmeister, apologies for mucking up the neat bloggy appearance!!! Don’t worry, we know who are. Baaaahh. I thought that somebody had opened the gate to the sheep pen! Thanks so much for all of your efforts on my behalf. As Ian said, a valiant attempt, and certainly worthy of a pint or three when we finally meet up. Greatly appreciated. The ‘codger’ trope has been fun, but in reality it’s an irrelevance. I have supported the Boro away from home for over 60 years by buying a ticket or going through the turnstiles to join the general throng, sometimes informing those I get chatting to of my allegiance, sometimes not. It’s always convivial. Like GHW I have never experienced one iota of difficulty. The only time I really stand out is when I am the only person sitting down when the Boro concede a goal. Like GHW, I clap discreetly, and say ‘Great Goal’ whenever we score. There must be millions of people up and down the country who have enjoyed their football in this manner over the years. It’s what you have to do if you want to have a more civilised experience than standing behind a goal, next to young chanting and drum banging supporters, and being locked in after the match. If more efficient, computerised security measures lead to the demise of this way of attending matches, then it is a serious national issue, the cost of which will be measured in millions of pounds to the clubs themselves. Wigan v Boro is not a big match. It is not a local derby. it is not a sell-out. It is a bog-standard Championship game between two teams, one of which is currently struggling, without a manager, and in need of as much traffic through the turnstiles as it can get. There will be thousands of empty seats in the stadium on Saturday,as there will at every other Championship game. In this context advances in security which have the direct consequence of penalising large numbers of responsible fans who simply want to go to a match is a kind of lunacy, the chief victims of which will ultimately be the clubs themselves. **AV writes: He may need a zimmer frame to made the run but he still got on the end of his own cross! Remarkable. Meanwhile, Reach crosses the ball into the middle and the crowd,. as one, lifts from its seat in anticipation…..
as Vossen smashes the ball into the net. Sadly the linesman’s flag is raised. Maybe next time then….. Terrific podcast. I’m thoroughly convinced by the analysis. Congratulations all round. Can’t think of a suitable name but something like The Inside Story would give a fair idea of the attempt being made to provide an informed general narrative within which we fans can begin to make sense of the individual matches we see. After all that work doing box to box Mustoe posting it was good to see Len poach the winner even though it bounced off his chair lift. Would I support a World Cup boycott? Too true. The problem is Septic would have a tournament in Papua New Guinea with Andorra as top seed and it would make no difference. The only hope is the report being leaked and the FBI getting involved. The problem we have is that the bloodsuckers probably dont think there is a problem, once they get their trotters in the trough they forget the game. Stymied by a Venezuelan sparky tripping the breaker and hence the WiFi just as I was ghosting in to the six yard box at the back post, you just can’t trust the Latin’s to play fair can you! Never mind, I get a lift back to the hotel every night in the equivalent of a Trabbant, in fact I reckon that the ‘T’ has more going for it! Frank Skinner came out with one of the best lines I’ve heard about Sepp Blatter years ago, when he said that went to school with Blatter’s sister, Fanny! I hope that was like my tap-in and not over the line! Watched the last 25 minutes of the U21 match, I knew Gibson started but he didnt finish the match and injuries were mentioned.. Nothing yet on the FA or BBC sites. Prepare for bad news. Didn’t see the actual incident but the commentator said he (Ben Gibson) pulled up when no-one was near him “which is usually bad news” then tried to carry on for a while before having to be substituted after about 42 minutes, limping off. Knee or ankle? England were 2-1 up at the time but conceded within a minute or so and went on to lose 3-2. **AV writes: Ankle. He turned it then ran it off and put in a few big blocks before hobbling off. Hopefully not too bad as he carried on for a while. Probably a doubt for Wigan though. Watched Scotland and the ROI playing hump and hope football enhanced only by Roy Keane’s special brand of clogging everything that moved then endured England playing on a cabbage patch which made the former Baseball ground look like a bowling green. Now we have Ken and Ben both injured will Milos Veljkovic finally get an outing against Wigan at CB or will one of Ben or Ken be fit in time, Rolls Rhys is still up on the ramps so will Woody do a Pardew and come back from the dead? At least we have Refs with Shaving Foam to look forward to in the New Year. **AV writes: I would suggest Ayala & Veljkovic (who will be brilliant) with Ben on the bench if needed. I’m looking forward to seeing Veljkovic if he plays as he has been here a few weeks now and indoctrinated into Karankadology. It is very noticeable that the practice of not throwing new signings straight into the fray pays dividends for seemless transitions and continuity under AK. I’m guessing that Woody is nowhere near fit then or he has been consigned to the Riverside recycle bin. Woodie is one of those characters in a thriller who never actually appear, you think you see him in the corner of your eye but when you look he isn’t there. Our very own Scarlet Pimpernel! no worries – I’m out of the office on Thurs/Fri so if you do want the tickets I’ll need to know soon. I can always get my daughter to bring them in with her on the days I’m out. You and Mrs B have a great day out Martin, something will turn up. I fully support an England WC boycott. In fact I think, unless somebody makes a sacrifice and takes a stand that hits FIFA where it hurts, nothing will ever change. There is a reason why they are based in Switzerland along with all the dirty money. As a supra-national organisation they seem to be above any nation’s law. However I don’t think there would be any point in going it alone with a boycott. England would be too easily dismissed: ‘There they go again, they’re just sore losers, they wouldn’t have won it anyway and they know it.’ On our own, it would be just a futile gesture that would lead to long term isolation. No, the FA would have to ensure a concerted effort with at least a handful of the big players dropping out together. Having lived in Asia and travelled a lot, I suspect there are countries where the protests are viewed with confusion and the FIFA shenanigans seen as benign. So England would have to take care to ensure there are enough like-minded countries to form an alliance with impact. Still, maybe the FBI can do something before it comes to that. On the other hand, what US laws have been broken? As I understand it, that’s the limit of their jurisdiction so I’m struggling to see how the FBI can have any leverage on FIFA. It’s up to UEFA to force the issue here (mind you I expect they are not exactly whiter than white) Take away Brazil and who really cares about FIFA? I reckon the European championships are better than the World Cup anyway. It wouldn’t be long before the FIFA affiliated teams came knocking on UEFA’s door. Not too disimilar to the FA (and Sky money) setting up the Premier League and leaving the Football League with egg on their face! Wouldn’t take a genius to make the next leap with UEFA having a competitive tournament by invite at the same time with the big Euro Nations plus USA, Mexico, Brazil, Uruguay, Argentina, Australia and say China and Japan “invited”. TV rights, advertising, sponsorships and clever Marketing would make it a far more appealing prospect to individual FA’s. There will be some link to Fifa in the USA, they are part of a confederation that belongs to Fifa, Michael Garcia is a US citizen, some big companies sponsor Fifa like Coca Cola. I don’t think they will get very far as will nobody else until Septic leaves the building, what depresses me is that the person who published the summary was supposed to be an eminent and respected legal eagle. There was always officer Dibble! So, Latics have appointed Malky Mackay. Their fans seem relatively pleased although the local MP isn’t! Funnily enough, Whelan was denying it was a done deal earlier in the week. Let’s hope he doesn’t inspire them on Saturday!